In addition to adorning abodes, floor mosaic labyrinths had a sage-like usage for wealthy Romans. The paths on their floor or turf labyrinths (or mazes,) helped them reflect and deliberate; they were locations where ideas could originate. 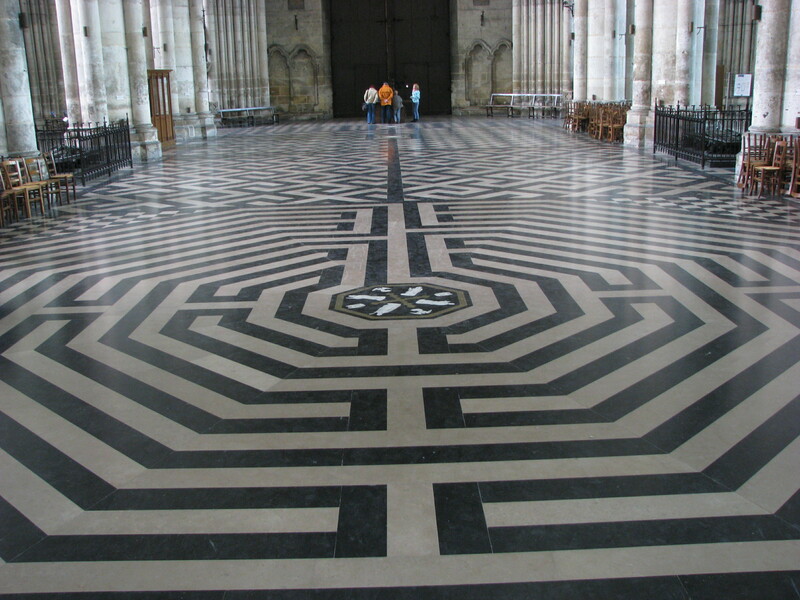 After the fall of the Roman Empire, the tradition continued with medieval Christians as they decorated their cathedrals with Prayer Labyrinths. These were stone or marble floor patterns, arranged to compliment architectural elements within their religious structures. The path designs merged the Roman four quadrant maze style with the classical labyrinth, resulting in organized circuits that coursed through separate geometric sections. The adaptation of the labyrinth/maze into Christian places of worship held much symbolism. Progression through the courses represented the pathways of the lives of the devout – the way back to God. As the traveler passed though the sequences, she/he reflected on the cycles and changes in life. 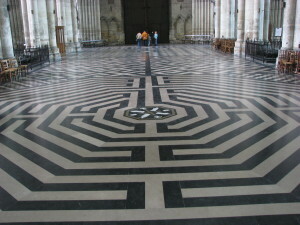 The labyrinth/maze also symbolically represented knowledge and mastery. It was a time in western history when craftsmen were reacquiring lost construction skills. The exact patterns displayed mastery of the compass and square. The spiritual nature of the labyrinth pushes forward today. “Walking meditation” has been proven to be a great way to reduce anxiety. The path of the labyrinth provides a tangible solitude that is required in today’s frantic society. Labyrinths are popping up in public areas and, similar to the Romans of old, many people are constructing backyard labyrinths to use for stress relief and decoration of their grounds.